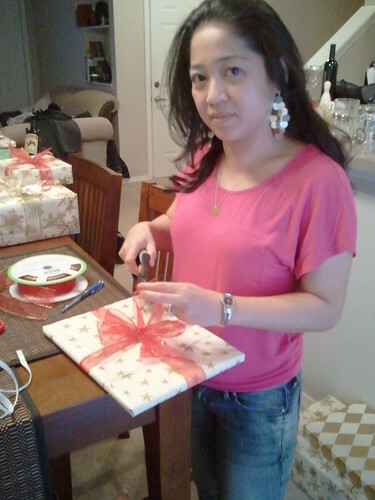 Posted on December 24, 2011 by Ching under Family, Things to Do, Tips, Travel. I know a lot of people were still doing some last minute holiday shopping yesterday and possibly even today. Not us. We bought almost everything prior to and during Black Friday. Why? Because we are weirdos with OCD who don’t like to wait until the last minute to do stuff. We like to plan, plan, plan AND well in advance. 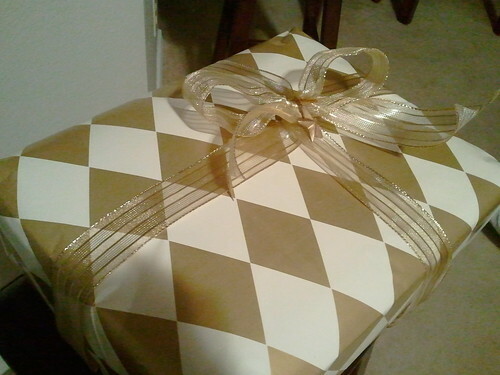 The gift pictured below was one of the first ones to get wrapped and gifted. 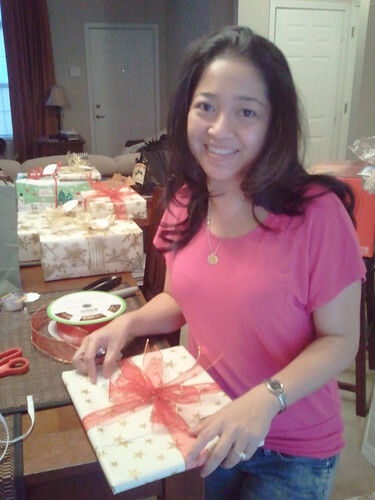 There were three identically wrapped gifts in different colors for Carmen, Tiffe and Sunni. I had them ready by the first of December because they were for people at work and some like to take vacation during the holidays. I never know when they’ll take off and then I miss the opportunity to give them their present before the holidays. I was going to put the presents under my Mardi Gras Christmas tree as part of the decorations. You know how people put fake presents under their Christmas tree? Well, I wanted to do that. Except mine would be real presents. After talking my idea over with Amy, who suggested that the presents might disappear after others figured out they were real, I decided against it. 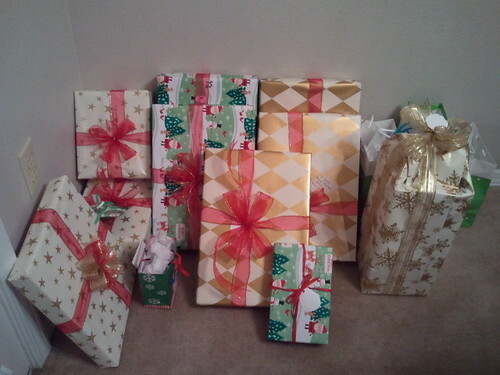 I kept the presents at home until I was able to hand them out last week. 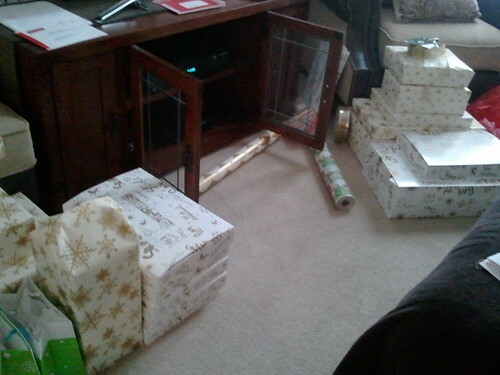 The gift piles were actually in the living room before they finally made their way to the dining room. 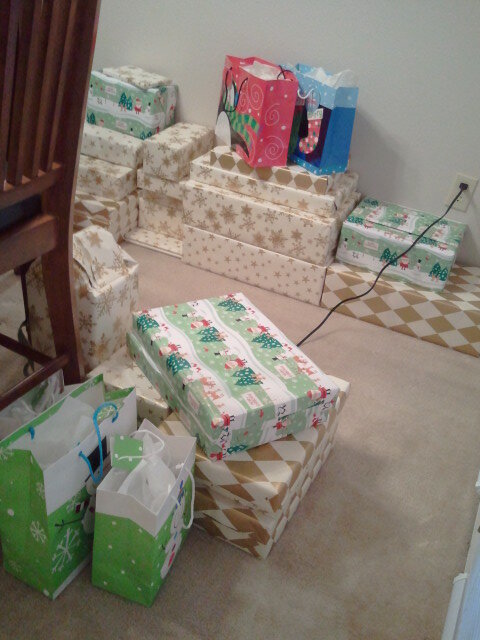 After I finished wrapping everything, we decided to move them to the dining room because we were tired of having to step over and navigate around them. It gets so cramped in this little townhouse. I think I’m asking Santa for a house next year. I know it might be challenging for Santa to fit a whole house in his sleigh, specially with all the other presents that he has to deliver, but he’s magical so I’m sure he’ll figure it out. I forgot to mention the Phelpi and Feifels pile. We saw the Feifels on Christmas Day last year so we had their stuff in the “Christmas Day” pile at first. 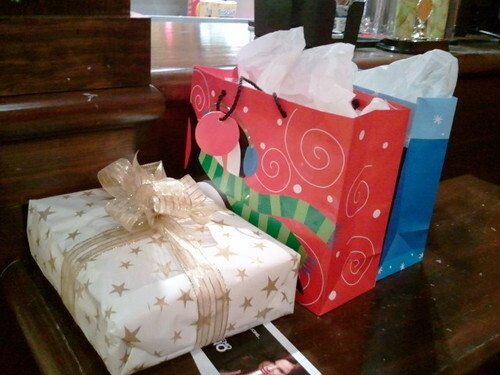 However, we weren’t sure if we would see them on Christmas Day this year so we went ahead and gave the Phelpi and the Feifels the gifts for their kiddos when we took everyone out to dinner at PCP last week. 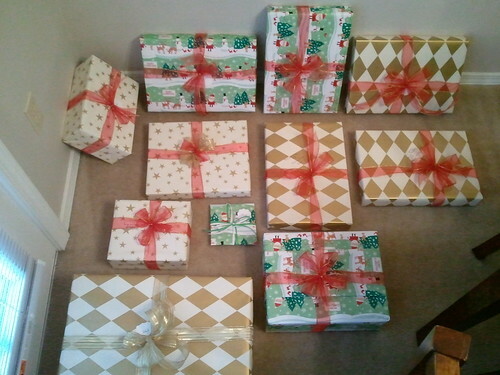 Brian hates that I try to remember who gets what present by size and shape and gift wrapping paper and bow. I must say that it’s easy to remember until it’s time to unwrap them. With the chaos and mayhem and multitude of presents to unwrap, I start drawing blanks. Then a guessing game follows. It’s kind of fun, unless you’re Brian. In which case, you just find it frustrating. LOL. 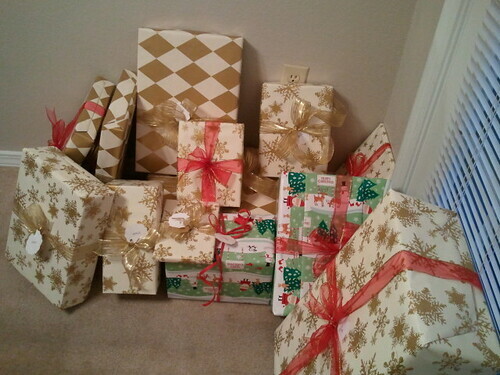 So anyway, he made me tag all of the gifts this year. He did help me make these neat embossed gift tags. 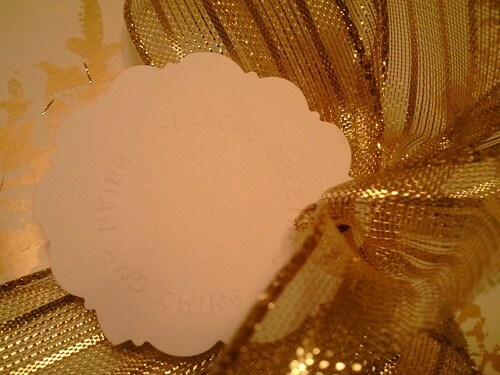 It’s hard to see from this picture, but there’s a snowflake in the middle and the words “SEASONS GREETINGS” and “BRIAN AND CHING” around it. We had to save the bows and gift tags for last because I prefer to do real bows as opposed to the stick on kind (unless I’m feeling lazy or don’t have enough time to put my fancy bows on) and I didn’t want them to get smooshed. I’m actually not sure that “smooshed” is a word, but I’m using it anyway. I take that back. I’m pretty sure “smooshed” isn’t a valid word because a red squiggly line appears underneath it each time I type it, so let’s just say I didn’t want the bows to get flattened instead. Sorry. My OCD is kicking in real bad this morning. 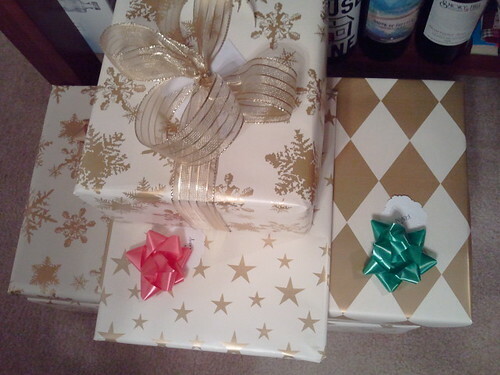 I put bows and tagged the last remaining presents yesterday afternoon while Brian was playing video games. Check out the finished product below. This is the “Christmas Eve” pile. This is the “Christmas Day” pile. I can officially say we are ready for Christmas. How about you? ¿Estás listo para la Navidad? I had to throw some Spanish in there because I try to practice every now and then. I got to practice with my friend Rene at Suede last night. He’s a regular and is always there. I asked him, ¿Que hiciste ayer? because I’m trying to practice using the past tense. He told me that he worked yesterday until he realized he actually had the day off. LOL. I speak terrible, broken Spanish, but I guess it’s enough to get by for ordering food at restaurants. I’m glad all the Latin American people I know are patient with me as I practice. While we were dancing last night, I wanted to keep speaking Spanish but didn’t know what else to say so I said, Este zapato es tu zapato. Rene started laughing and nodded, Si – estos son mis zapatos. Whenever Brian and I are talking, I spit out random thoughts out of nowhere. It’s nice to know that my randomness has transcended the English language. LOL. When we sat down on the couch, Brian explained that I’m trying to practice speaking Spanish every chance I get. I encouraged Rene to keep talking to me in Spanish so I can continue practicing. He talks really fast sometimes so I frequently have to ask him to slow down. He also has this habit of asking yes or no questions and I’m not really quick at coming up with responses yet. While the three of us were sitting there, he asked me something that one could answer with yes or no so I replied, Si. He said something else and I said, Si, again. Then he said something else and when I replied with Si again, he started laughing. He was like, “So if I asked if you would like to jump off a bridge, you’d probably say yes too?” LOL. That reminded Brian and I of a tip we heard from the cruise director during our honeymoon cruise almost ten years ago, so we shared it with Rene. The cruise director said that it’s better to book excursions through the cruise ship as opposed to venturing out on your own because things can go wrong sometimes. He knew that people want to do their own exploring and want to go shopping for deals in town so he shared some valuable advice about how to select a cab before we arrived at our first port in Cozumel. He said, just ask them three questions and if they answer it correctly then you know it’s safe to get in the cab. You’ll likely ask, “Do you speak English?” and they’ll say yes. Then you’ll ask, “Can you take me to town?” and they’ll say yes. If you ask, “Is the sky green?” (or some other similar question which you know that the proper answer isn’t yes) and they say yes again, move on to the next cab. We all got a kick out of it because I was that cab driver last night. Fun times! Anyway, ¡Feliz Navidad y Prospero Año Nuevo! to all of our Latin American friends. To everyone else, Merry Christmas and Happy New Year!